Newspaper, an authenticate and complete issue of the Newspaper: Federal Gazette & Baltimore Daily Advertiser, September 21, 1796, 4pp., disbound, VG. From the interior and running six columns over pages 2/3, there is the complete Farewell Address which is signed in type, "G. Washington. United States, 17th Sept. 1796." 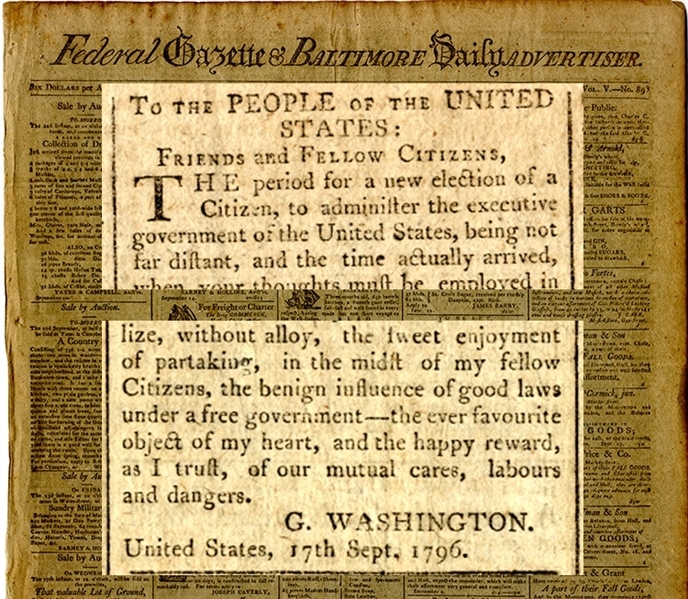 It is addressed "To the People of the United States: Friends and Fellow Citizens." The address, written with the aid of Alexander Hamilton, and was crafted as an open letter to be published in newspapers such as the Federal Gazette in the early fall of 1796.